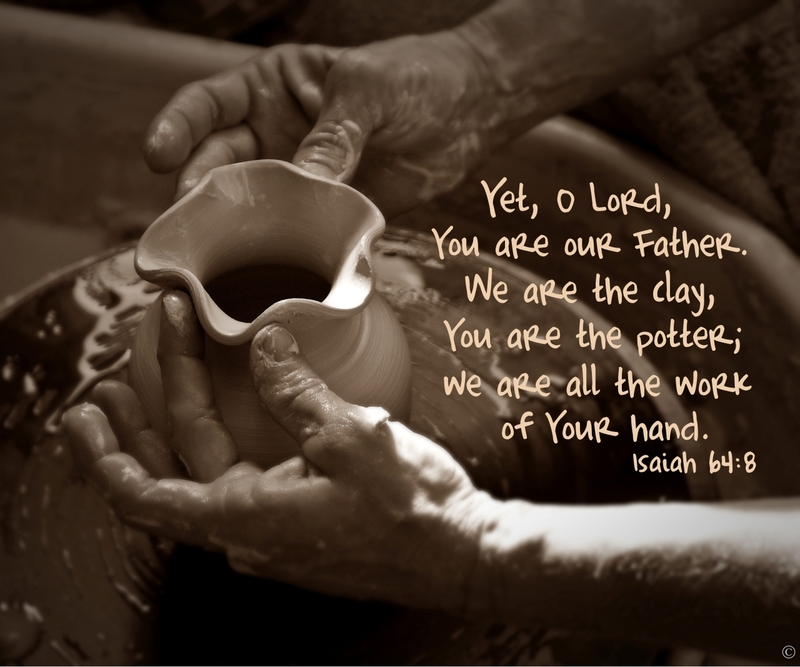 You are probably familiar with the passages of scripture referring to God as the Potter and we are the clay. Isaiah 64:8 There are so many verses you can attach to this lesson and so many truths. One of my favorite examples is the one I wrote while teaching a Pioneer Girls group to make ceramic items for Mother’s Day. You can use already poured ceramic pieces from a ceramic store, a plaster piece from a craft store (oven would be for example only and not needed for actual firing – so five mins max), or raw oven clay to make pots, jewelry, picture frames or characters. Use your imagination based on your knowledge of your child so that they can use theirs. I would encourage you to find a potter or ceramic painting store and try this with your child. Or you can find a potter’s wheel and structure the lesson around making a pot. You will have to adjust the lesson depending on what product you start with. For the purpose of teaching the concept, I am using green-ware from a ceramic shop. If you can, use a piece of green-ware that has not been fired and still has the seam edges in tact. First the child picks the piece; just as God selects people to work on through the Holy Spirit and they come unto Him as His child. Next, the instructor will show you how to scrape the seams down until the seams are smooth. This is how God begins to clean up our life from all its rough edges left by the world (which was the pots mold) we came out from. He is gentle but firm so as not to break us, just as you must be with your piece of ceramics. Then you will sand lightly until there is no more visible signs of the seams. God will send spiritual sandpaper into your life to remove all the traces of the world. I often refer to some people as my spiritual sandpaper (in a loving way). Next the instructor will place your piece in the kiln to be fired until it is hard. The fire is just the right temperature so as not to cause the piece to explode. I Corinthians 10:13 in the NKJV reads, “No temptation has overtaken you except such as is common to man; but God is faithful, who will not allow you to be tempted beyond what you are able, but with the temptation will also make the way of escape, that you may be able to bear it.”. In other words nothing will ever be so bad that it will cause you to lose your faith in Him. The ‘fires’ in your life that God allows you to go through will make you stronger, not cause you to explode. *You may want to make your own mold. An easy one is the globe. Take a tennis ball and cut out a small ‘pouring hole’ at the top. Now cut the hole in half all the way through the ball until you have two equal halves. Wipe the inside clean. Now put it back together using heavy rubber bands. You have made a mold. Now pour a liquid molding substance, slip or plaster of Paris, etc. into the mold. Keep checking for it to be setting up because you want to pour out the excess to leave it hollow. Now let it sit overnight to dry even more. Remove the mold and let stand to air dry. With this mold you can do a World, a Light bulb, a head … so many creative avenues and you can use your imagination to adjust a lesson around the piece. Use your imagination and ARM your child.